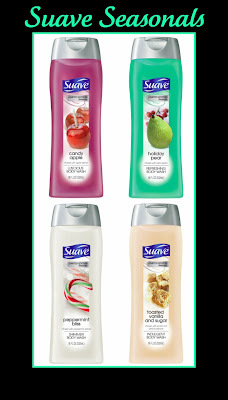 Suave's Holiday Seasonal Body Washes are out again! These are now available at Walmart and other select retailers with a price range of $1.92-$1.99 for each 18 fl. oz. bottle. I absolutely adore these not only for their delicious scents. but also because they have such a rich lather and feel as if they cost much more than they do! These are the perfect Fall/Winter indulgence, and the size has been increased from the 12 fl. oz. last year, to a huge 18 fl. oz. bottle. If you haven't tried these yet, or you love them already, hurry and pick them up, because they disappear from the shelves quickly. My personal favorite is the Peppermint Bliss, but I always pick up all of them because the are so luxurious and smell wonderful. Update: According to Suave, the following locations are stocking the body washes: Kinney Drug, Wakefern, Marc Glassman, Stop & Shop, Supervalu, Walmart. I missed these last year; after your post I went to our local WM and every other place around and they where gone. I'm my way tomorrow morning to get them, Yay! Oooh, peppermint bliss! I LOVE all thinks pepperminty around the holidays. Thanks Mary! I want! Mary, do you know which other select retailers will have these? I really don't want to go to Walmart unless I have to. And mine didn't even have these last year. I realllly miss the Hot Cocoa one! I wish I had bought cases of it when it was in stores. PLEASE bring it back! I had no idea that Suave made these holiday body washes. Hope I can find them. They sound yummy. Wow, new to me. I'll be on the lookout, especially for pear...such a clean fresh scent. I want to get all of these! How exciting! Has anyone in TX found these. I've been looking the last couple of years and can't seem to find them. I want the Peppermint one so bad!